Inspired by the above movie, I made another character. This one is a Rogue, called Grimsieg, a name I shamelessly stole from one of my brother’s D&D characters. His Grimsieg was a half orc assassin. Mine is a human. Instead of rolling him up on my usual server (US-Darrowmere), I made him on a RP server I have heard good things about (US-Wyrmrest Accord). Everything I’ve heard has been confirmed. I knew I picked a good server when I didn’t feel like I needed to take a shower after roaming around Goldshire and Elwynn Forest during my leveling, like I did when I was leveling on US-Moonguard. That place is the most populated RP server, but also has the most sickos. Fortunately they all seem to congregate in Goldshire at the inn, but still… ick. I’ve been playing him for about a week or so now, and he’s at level 51. I specced him as Combat at first, but now I’ve switched over to Subtlety since I don’t have problems with his energy generation (there is a talent you get at around level 40 with Subtlety that pretty much solves your energy problem. I like both Combat and Subtlety specs, and my intention was to level with Combat and do PVP with Subtlety, but I’m enjoying leveling with Subtlety as well. I really enjoy Shadowstepping right behind someone, hitting Premeditation, Ambush, then one Hemmorhage and Eviscerate as a finishing shot. Sometimes they die at Ambush. Subtlety does a nice huge burst at the beginning, but can’t stand in melee like the Combat spec. The nice thing about Subtlety is that you don’t have to stand that long, because your Ambush and Hemorrhage has knocked down the health of your opponent quite a bit, so you have only a little while until they’re dead. So far my experience has only been with PVE questing. I haven’t ventured into dungeons or done any pvp yet. I’m would be ok with dungeons, but with PVP I think I still need some practice and to get my keybinds set up intuitively. Right now I’m struggling with getting them set up in a way I like. I think I’ve figured out how to do it, but I have to switch over and see how it works. Once again I’ve done some transmogrification to a couple of my characters to make them more pleasing to me aesthetically. This time around my vict… umm clients, I mean, were my Paladin (aka Goldoath) and my Death Knight (aka Wraithstar). Both are Draenei, and so taller and bulkier than humans. I like that for melee characters, because a hulking guy with a sword is more intimidating in my opinion. That’s why I like Tauren warriors, for that matter. These looks are subject to change if I come across something I like better, but for now they’re good. Anyway, first up is the paladin. He has a set of tanking gear used in his Protection spec, and a set of pvp gear used in his Retribution spec. 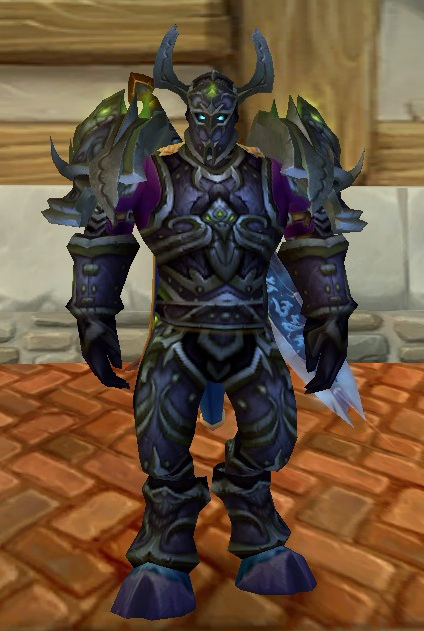 For his tanking set, this is the one set I’m the most unsure of. I basically set him up in armor identical in almost all ways to the Stormwind guards. Very smart looking, but I’m looking at a few other choices. Goldoath in his tanking gear. For PVP, I went to an old set of PVP gear, which had some major advantages. First, I like how it looks. Second, it was relatively cheap. Third, it isn’t being copied by a lot of people. I like the blue as well. It kind of reminds me of stained glass, which reminds me of cathedrals, which goes well with paladins. This one I’m very sure of and doubt I’ll be changing as things stand. My next one is for my Death Knight, named Wraithstar, and currently my favorite. For a long time he was just there to make gems for my other characters, but I decided to give him a spin and look into gearing him up for pvp and pve, so he’s the one I’ve been playing the most recently. This first picture is his DPS gear, worn when he’s running dungeons and such. 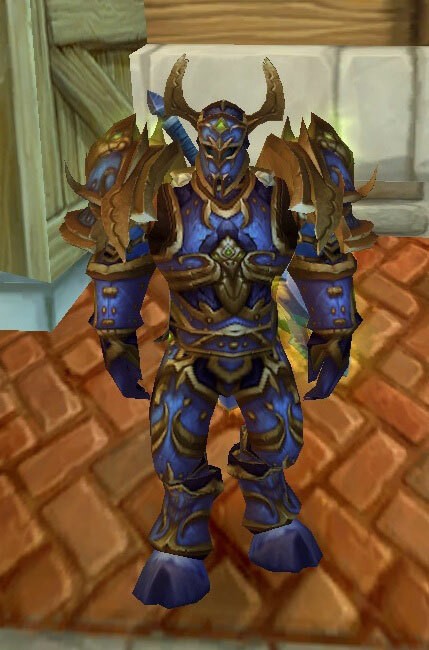 This is the same armor you get after you graduate from Death Knight trade school. A nice set of blues that pretty much hold you for several levels. Silly me, I threw the originals away as I upgraded them, but in my defense there was no transmogrification at the time. This set is available at The Ebon Hold, or DKHQ as I like to call it. Finally, we have his PVP gear. 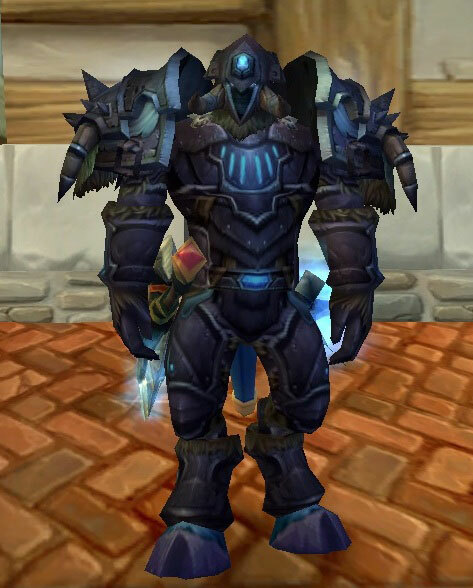 At first, his gear had the same look as the gear Death Knights start out with before they graduate from DK trade school. A set of greens that look like cultist robes. Kind of nice, but I really don’t like robes on my Draenei for some reason. I should point out that the “cultist robes” are pretty popular in the DK community, just not with me. Anyway, this set is very similar to Goldoath’s PVP set (above), since it comes from the same PVP season. The colors are different, as befits a dark and brooding DK. I like this much better than the cultist robes. And there you have it. In future I’m sure I’ll have more gear transmogrified to suit my fashion tastes on different characters. For now this is it. Feedback is always welcome. It’s been a few months since I started playing World of Warcraft (since June 2010). So far I’m pretty happy with it. I started with a Horde character (Rathstar the Tauren Hunter) on the Darrowmere server and got him up to level 85. All the while I was creating and leveling other characters as a break (and because that’s what I do with every online rpg I play). Unfortunately, the guild my character started with (Mass Redemption) changed a lot. I don’t think it was really a good fit for me in the first place, but I’ve always had the opinion that there is give and take in organizations, and you should try to fit yourself into them as much as they should try to fit themselves to you. However, after a while some people I counted as guild buddies left, the guild leader stepped down and handed the guild over to the one person in the guild I actually actively disliked. I reviewed my situation and decided it was time to leave the guild. 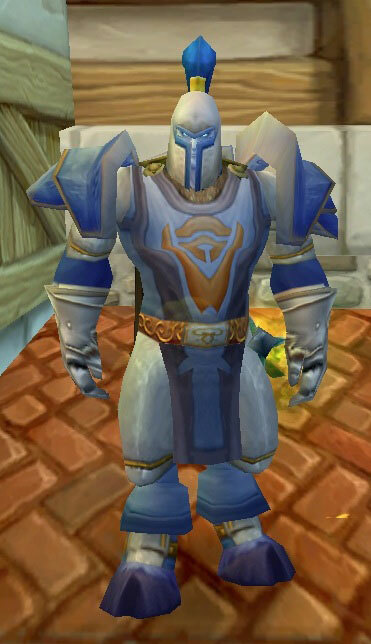 I lost interest in Rathstar and started an Alliance paladin character (Goldoath), still on the Darrowmere server. I found that I actually enjoyed playing the Alliance side for several reasons, mostly having to do with aesthetics and being on the side of the good guys for a change. In addition, I actually found a nice guild, small and fairly tight knit. They were a group of friends and family members who welcomed me and made my gaming much more pleasant. The upshot of it all is that I changed factions on Rathstar, changed his name to Wrathstar, and made him a Worgen Hunter in the Alliance, and now I have a lot more fun playing him. At the moment, I have two main characters, Wrathstar the Hunter and Goldoath the Paladin. I tend to switch back and forth between them, and both have some interesting things going for them. Now it’s time for a farewell to Warhammer Online. My purpose was to give it a try while I waited for my World of Warcraft disks. For a while I played both at the same time, but in the end I knew I’d have to pick one of the two because I wasn’t going to pay for both. 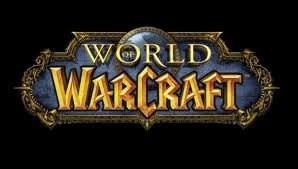 My final decision was to go with World of Warcraft, for several reasons. I’m going to cancel my Warhammer Online account and see if I can get a refund of my unused time (not holding my breath on that), and will just move over to playing WoW full time. Warhammer Online had some good things going for it, but in the end it was the things I didn’t like that killed it for me. 1. PVP – (also called RVR in WHOL). One big team vs. another in a huge area fighting for control of objectives and keeps. Very nice game play. I liked that if you wanted PvP, you entered those areas. If you didn’t, you stayed out. However, almost the whole point of the game was to enter these RVR areas and duke it out with opposing faction players. I always had fun, except at the first tier (level 1-10) where so called twinks ruled. These were players on the endless free trial who had gear that was way out of line with their level. That was annoying because when they entered the field, you could just hang it up and go home. 2. Public Quests – These were quests on a timer that anyone could join in. Everyone who participated was scored on their level of participation and success with a random number tacked on. The ones who scored highest at the end of the quest (if successful) got better loot. I liked public quests very much. 3. Elves – unlike WoW, elves in WHOL have normal elf ears, not the donkey handlebar ears you find in WoW. A minor point but it still annoys me about WoW. 4. The world, background and history. Incredible, naturally. Warhammer has a long history and this rich background was brought over to the online game and really shows. 1. Class Specialization – each race has access to a specific class which is not available to other races. Each class has special abilities and they are unique to that class and race. Now, it’s true that each mechanic used by the class has an equivalent in the other class. For example, the Bright Wizard mechanic of building up fire energy is mirrored in the Dark Elf Blackguard who builds up Hate. But Bright Wizard is a ranged DPS class while Blackguard is a tank class. One of the main complaints I heard over and over was that the classes were unbalanced. My preference is for a generic class (warrior, for example) playable by any race and let each races innate abilities color how it’s played. This was a problem for me. 2. Server selection – Let’s face it. Warhammer didn’t make it big like everyone hoped it would. Currently the game is limited to four servers and has no signs of getting more. There were undoubtedly plans for expansions and additions, which probably had to be shelved when it didn’t succeed. I didn’t want to hitch my wagon to a falling star and have to leave it as things go worse and worse. 3. Graphics – The graphics load on my computer was worse than WoW. It tried to be much more realistic than WoW, and that was nice, but slowed things down for me unless I turned most of the cool graphics down. In huge fights, it was just terrible. Framerates were low, and lag was really bad. 4. Focus – with a focus on RVR (aka PVP), it’s my opinion that gear should not be what makes a character better than another, but rather the abilities one takes vs. abilities your opponent takes. Sure, gear can make a difference, but I found it was a huge difference. In the end, WoW has more good things going for it than bad, and like I said, I’m only going to spend my money on one of these games. I chose WoW. I think it was because we were trying to flip all keeps and battle objectives over as quickly as possible. We tried a tactic where we took one BO, then move on to take the other immediately. Once we took that one, we move back to the first one to wait for the defense tick (that’s where you have to defend an objective for x minutes and get renown when the time is up and it hasn’t been taken away from you). We then ran quickly to the second BO and got the defense tick on that one. Normally you take a BO and wait for the defense tick, around two or three minutes, then you go to the other BO, take it and wait for that defense tick. Doing both at the same time basically cut the time almost in half. Apparently, this tactic is called Iron Man (from the athletic event). Well, I had resolved by then to make my SW, Sywyn, my main character , so I left Grimsieg in a warcamp an now I’m playing Sywyn full time. Nice thing about Sywyn is his Renown Rank is nearly the same as his Regular Rank. This means his gear is probably as good as can be, right now. I need to continue to earn medallions in RVR, so I can buy the best gear if I don’t happen to earn it in the chests. This weekend I decided that my main character for WHOL is going to be Sywyn the shadow warrior. I resolved to spend all of my effforts getting him leveled up to 40 before I spend any time on other characters. I need more practice at the kind of fighting SWs are supposed to do, i.e. hit and run. He’s getting picked off by Destro characters he should be able to take out. I put this down to lack of skill on my part, but remember that he is a ranged DPS character and isn’t intended to fight in close. One nice thing he does have is all the available RVR gear you can get in Tier 2. My Bright Wizard Grimsieg wasn’t as fortunate. I’m talking about the special equipment you can get from the quartermaster or in drops when you successfully attack a keep. You have to get all your influence in the RVR lakes, which means you basically need to spend all your time in RVR. My plan is to put Sywyn straight into RVR at each tier until he has filled up the influence for each t ier, and has the required renown, then hhave him run through the public quests and fill them up for each chapter in the Empire at least, maybe into other areas depending on whether he’s leveled enough in regular rank. Hopefully this plan works out. My shadow warrior, Sywyn, finally got rapid fire and it is my favorite ability right now. Shooting off ten or more shots in rapid succession is pretty awesome. I can tell I’m causing some damage too, because the opposing faction is always targeting Sywyn as soon as he starts using it on people. I can imagine the frantic cries for help from people who’s health is getting hammered and them telling people to target that damned elf, he’s killing me! Soon after than around four or five people are shooting at Sywyn and he usually has to duck under cover. But… that’s five people shooting at me instead of everyone else on my team, like spellcasters or especially healers. The real kicker is that Sywyn has an ability that can kick in after he’s been shooting a while that will double his damage for X seconds. When I use that and my Rapid Fire, spellcasters take dirt naps. I look for spellcasters or healers mostly, and ignore tanks unless they’re the only target I have. Actually, the first thing I look for are squig herders. I hate them with a hate that cannot be described. Anyway, my choice of targets seems to have made me a priority target for Destro, which means I’m probably doing something right. Last night I logged on for a bit and was very happy to get several greetings and an immediate invitation to a warband. People seem to know Sywyn and want him in their warband, which is very gratifying. That evening we spent at Barak Var defending the keep from a very determined attack. I went up and started working the oil, which I’d never done before. It was a blast! There’s a lot of fun to be had dropping boiling oil on hapless besiegers and getting a combat message that you’ve finished off one or two players each time you drop the oil. I did this for hours as the siege went on and on, and got two renown ranks out of it in the end going from 16 to 18. It gave him some interesting new abilities and now I’m running out of room on my number keypad for them. Finally, Sywyn was promoted in his Guild (The Booty Brigade) from Hiney to Pioneer, so he’s no longer a noob member. For a while now, I’ve been playing characters in the Order faction. I have my elf, Sywyn, my Bright Wizard, Grimsieg, etc. Recently I decided to try out some Destruction faction characters and see how they play. I like to have a few different characters around, in case I get bored with one. Having a few backups from a very different background can keep things from getting stale and tedious. The same player can’t have characters from Order and Destruction on the same server in WHOL. I think it may have something to do with preventing spying or other nefarious activities, since the main activity of the server is fighting battles between factions and there is a real possibility that a betrayal could seriously hamper one or the other sides. I chose the Badlands server for my Destro Horde. I had a character on Badlands from a long time ago, a marauder I deleted because he annoyed me. Now I have about five new characters in total and have played them all up to a few Ranks each, to get a feel for them. Now I can switch between Order and Destruction and keep things relatively fresh. I have a couple of dark elves, a sorcerer and blackguard, a couple of humans, magus and chosen, and an orc choppa. No healers because honestly I don’t like playing them. I don’t think I’m very good at them. I chose a dark elf because I wanted one of those cool looking T-Rex mounts. Finally, I need to pick a main character for each server. For order I think I’ll be going with Sywyn the Shadow Warrior. He was the first character I’ve created, even though my BW Grimsieg is now higher level. He’s advancing evenly in Renown and Rank, which I like. On Badlands, I don’t know which one I’ll pick as my main character. Maybe Zakzak the Chosen. Probably the sorcerer because I want the dino-mount. Recently the persistent world I play on has seen the return of an old DM. Many As One (MaO) was a popular DM with some players. Now he’s back and I have mixed feelings. Like all DMs on FRC he has strong and weak points. If there’s one thing you can count on when MaO runs a plot, it’s that failure to stop the bad guy will result in the end of the world as we know it. To be completely fair, he’s not the only one. Several other DMs are firmly in the epic end of the world plot corner. “Why is this a problem anyway?” you may ask. Who doesn’t like a nice high stakes adventure? It gets the blood pumping, right? Well… not after the fourth time in a row, no it doesn’t. For several reasons. First, it overshadows every other DM plot that doesn’t involve the end of the world/galaxy/universe/plane of existence as we know it. I have personal experience with this. I came up with a plot in which political intrigue played a big role. The plot didn’t involve the end of the world, just some minor but important local changes. The plot was dropped and/or put on permanent hold because…. A VAST ARMY OF DEMONS AND ORCS WERE INVADING WITH THE GOAL OF DESTROYING THE WORLD!! Suddenly, a minor political intrigue centered around one small country wasn’t all that important, and players blew off the plot to join this other one. The main features of the world ending plot were wave after wave of monsters, treasure, magic items, and wave after wave of monsters. Note that this was not one of MaO’s plots. Second, if the PCs fail, someone else (an NPC) will have to step in and save the world, because you can’t really let the universe be destroyed. Nor can you allow the kind of sweeping changes that failure might entail even if the world doesn’t explode. Guess what? The players know this, too. Third, if you save the universe and all you get is a lousy T-shirt, there’s a big let down. Seriously, if the PCs win and save the universe, what reward can you give that fits what they did and still allows them to play? They just saved the freaking universe and you’re giving them a magic cloak? Really? No kingdom of their own? No entire planet or demi-plane full of nubile, grateful, semi-clad and horny members of the appropriate gender? No elevation to demi-god status complete with worshippers and temple bureaucracy in place? Dude… they saved the world/universe/plane of existence/whatever. Fourth, during these plots, the local starting village is usually overrun by units of the mad halfling’s evil teddy bear/vampire army. Now, characters can’t go there and adventure, and nowhere else has areas appropriate to their level. Not everyone will have the opportunity to get involved in these plots, especially lower level characters, but they have to deal with the bad side of it. In three of four world ending plots I can think of off the top of my head (which actually occurred in this world) the starting area was overrun by the bad guys and effectively became off limits to certain PCs who were in no way involved in the plot. What’s the lesson here? 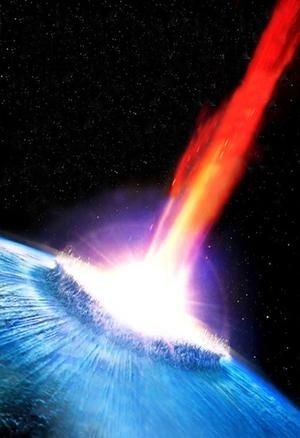 Quit trying to end the world! Your plots can be interesting and draw in players without threatening everything they know and love. In fact, you should probably not do them at all unless you involve the whole DM team. We’ve had no less than four major, server wide, world ending plots in a row on FRC and I’ve heard PCs literally yawn and say “Again?” when a major bad guy surfaces and threatens to destroy the world. There’s a major loss of suspension of disbelief. My advice? 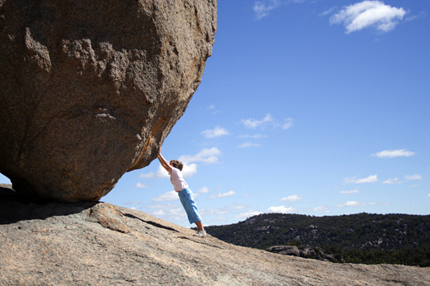 Find a way to scale it down. If you want to challenge a group of adventurers, have another group move in and start supplanting them, for example. Have a small local bad guy do something a group can oppose. Alternatively, have a small group of good guys move in and start to make things difficult for the local Team Evil. You can keep it small scale and still keep it interesting. Just make sure something is at stake that a particular group of player characters value.